Relationships with other people are a key ingredient to living a good life. The success of Facebook is certainly due to this idea. But if you are only friends on Facebook, are these real friendships? Other than being in a special interest group, I propose that these friends provide only shallow connections, not the deep and satisfying relationships that I think we all want. There was a wonderful Toyota commercial a few years ago that illustrates my point (watch it here: https://www.youtube.com/watch?v=TUGmcb3mhLM). It featured a young woman sitting in front of her computer in her apartment, talking about an online article that proposed that older people are becoming more anti-social. She encourages her parents to join Facebook. While the daughter has nearly 700 friends on Facebook, she is disappointed that her parents have only 19 friends. As the daughter continues to talk and comment on what she is reading on Facebook, proposing that ‘this is living,’ the commercial shows her parents in their Toyota Venza driving to a wilderness area to go on a bike ride with their friends. 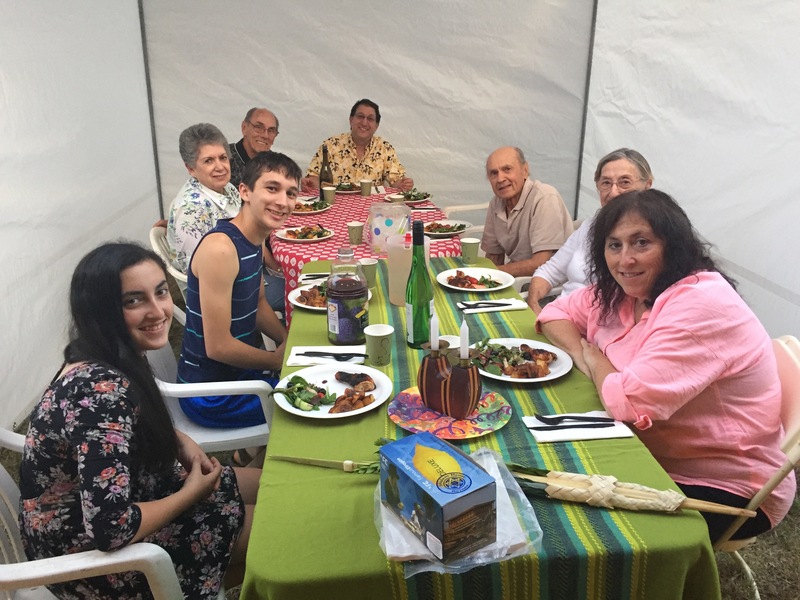 We are now in the midst of the Jewish fall harvest festival of Sukkot during which we build a temporary dwelling in our yards where we eat most of our meals for a week, enjoying the beauty of nature in the company of friends and family. It is a wonderful opportunity to connect and strengthen relationships in real time with good food and good conversation. Judaism advocates being in relationship with other people. It is how we experience greater joy during our celebrations and support when we have challenges. We are taught to love our neighbors as ourselves. We can only do this if we make time to spend with them. As much time as I spend reading my newsfeed on Facebook, I don’t pretend that this particular activity is the same as interacting with my friends. This is unlike the woman in the Toyota commercial. The activities shared on Facebook aren’t the entire truth of anyone’s life, but it seems to me that there are people who forget this reality. My newsfeed is regularly cluttered with videos, articles, and photos that people share that are not about themselves at all. There is also a growing volume of advertising. I use Facebook as a tool for letting people know that I am thinking about them, and I like being notified of birthdays so I can send a greeting. I’m fairly certain that much of what I post goes unread by those who are in contact with me if they have more than a few friends. It is very difficult for me now to sort the wheat from the chaff with all the information that comes through. The devices that allow us to connect with each other virtually are the same devices that distract us from connecting with each other in real time. I have a number of friends and clients who keep their mobile phones on the table when we’re together; they check the device whenever it makes a noise. But in order to really pay attention to each other, to nurture our in-person connections, we need to ignore the device. The younger a person is, the harder this seems to be. Unless something is an emergency, it’s important to be in the moment with the person in front of you. It takes time and energy to nurture relationships. That is one of the reasons I’m so grateful for Jewish holidays over the course of the year and for Shabbat (the Sabbath) each week. These calendar days are set to remind me (and all of us) to use these sacred times to be with one another. Time passes whether we mark it or not. It’s up to each of us to make time to be together, to catch up on the news of our lives, to be in the same space and really pay attention. This time is a blessing, as are the relationships it allows. So this week of Sukkot (which ends on October 5), I am enjoying the company and the meals we are sharing together. I consider myself wealthy and blessed in my relationships, that we make time for one another. I look forward to the new friendships that come my way, and the chance to share more good food and good conversation around the table. Rabbi Wendy Spears is a community rabbi in Los Angeles. Find her at http://www.rabbiwendy.com. You can also LIKE her Facebook page at Interfaith Wedding Rabbi – Rabbi Wendy Spears.